We knew that Clemson was going to be involved in what could be the defining game of the ACC season. It's just that everyone thought that it would be on Nov. 11 when they host Florida State, not this weekend in Blacksburg. Florida State's season is off to a disastrous start, though, while Virginia Tech remains ahead of schedule in the second year of the Justin Fuente regime. Clemson has gone through big changes, but they have served notice that they aren't going away. This matchup made for one heck of an ACC Championship Game last year, with Virginia Tech giving the eventual national champs quite a scare. Can it be closer this time around? Can Virginia Tech's home-field advantage make the difference? Or can Clemson cross this hurdle and take a giant step towards a third straight National Championship Game appearance? We obviously have to start with the Clemson defense when talking about this game. They have been absolutely ferocious this year - third nationally in both total yards and points allowed. They have totally stifled and frustrated opponents. There is a chance, though, that the defense could hit a bit of a roadblock. The cornerback corps has been hit very hard by injury. Marcus Edmond hurt his foot in Week 2 and hasn't played since. Trayvon Mullen is in the concussion protocol after last week's game, and his status is unclear. So is the status of Mark Fields, who hurt his glute last time out. If those three can't go, which is very possible, then the team will be without three of their top four corners and will be forced to start a very raw freshman. The obvious question, then, is whether Virginia Tech can exploit that opportunity if it presents itself. And the answer seems to be "yes" - at least potentially. Josh Jackson is only a redshirt freshman, but he has been very sharp to date. He has completed more than 65 percent of his passes and has 11 touchdowns and just one pick. His most legitimate opponent has only been West Virginia, so he is taking a big step up in class here, but he is the son of a long-time Michigan assistant, so he has grown up around big-time football and he isn't going to be intimidated here. Clemson beat up on Louisville, but Heisman winner Lamar Jackson still threw for 317 yards and three touchdowns, so the Tigers can be vulnerable to a solid air attack. Jackson will certainly have his hands full, but I would be very hesitant to rule out his chances entirely. And since we are on the subject of raw-but-talented quarterbacks, we have to talk about Kelly Bryant, the guy charged with the unenviable task of replacing the great Deshaun Watson. His passing stats don't tell anywhere close to the whole story - he has only two passing touchdowns and three picks, including two last week. Through the air he has only been mediocre, but he has scored seven times on the ground. More significantly, he is playing with a lot of poise and is showing leadership well beyond what you would expect given his experience. His passing numbers would suggest a mere game manager - at best - but he is far more than that. Virginia Tech's defense has pitched two shutouts this year, but they came against Old Dominion and Delaware, so they don't mean much. West Virginia scored 24, and East Carolina 17, so the team can be scored on by competent offenses. Bryant will have to be sharp, but he will have a chance to do some damage. The game opened with Clemson favored by 6.5 points on the road. The line has since moved through the key number seven in early action, with 7.5 widely available , and numbers as high as 8.5 being tested as I write. Clemson has drawn about three-quarters of the action in this one, so the line movement is as expected, and we could see more movement. The total opened at 51, and has crept up slightly to 51.5. The Tigers are 5-1 ATS in their last six games overall but just 1-4 ATS in their last five conference games. They have covered their last four spreads against teams with winning records. 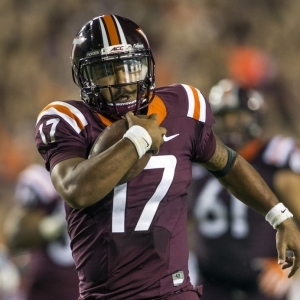 The Hokies are also on a roll, with a 7-1 ATS mark in their last eight. They have covered the spread in their last five home games against teams with winning road records. I'm going to be patient and then I'm going to gamble. I want the line to climb as high as it can, and then I'll take those points and go with the home team. I have all sorts of respect for Clemson, but these Hokies are well coached, and I like how they are playing. They will be tough at home, and they will be ready. I like their chances of at least keeping it close, so the more points the merrier.